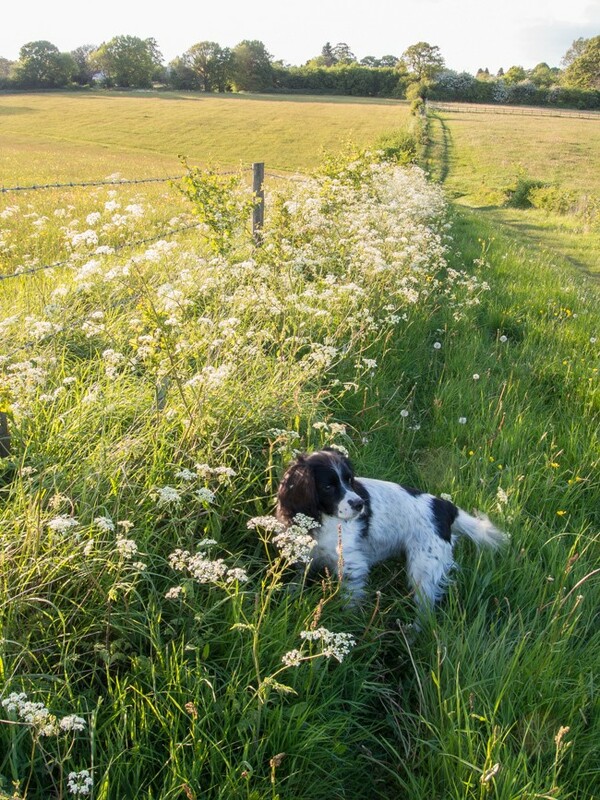 Having just come back from foreign climes, where the environment is much more arid than home, means I am fully reveling in the luscious greenness that is May in England. No dusty or faded colours paint the landscape green here. It is as if everything has been slapped with the freshest glossiest paint of every green shade imaginable. The frothy lace of cow slips fills the gap between hedge and path and hawthorn blossoms drip from every branch above and delicately fragrances the air. It seems I am not the only one rejoicing in the fullness of Spring; every little bird is singing at the top of his little voice as he flits from bush to bush busying himself with household chores. 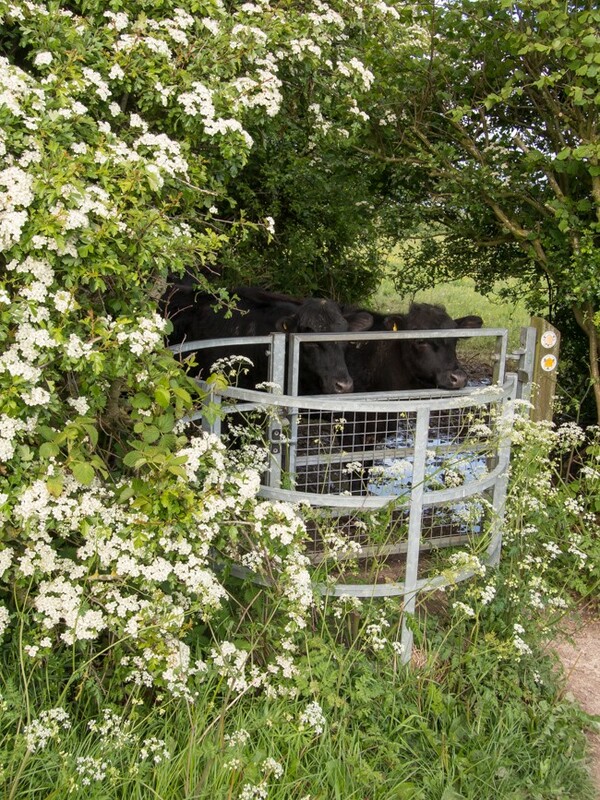 And the cows are chasing us along the footpath, though as I turn to confront them the breaks are applied so suddenly as to make the ground thunder under their hooves. What joys! 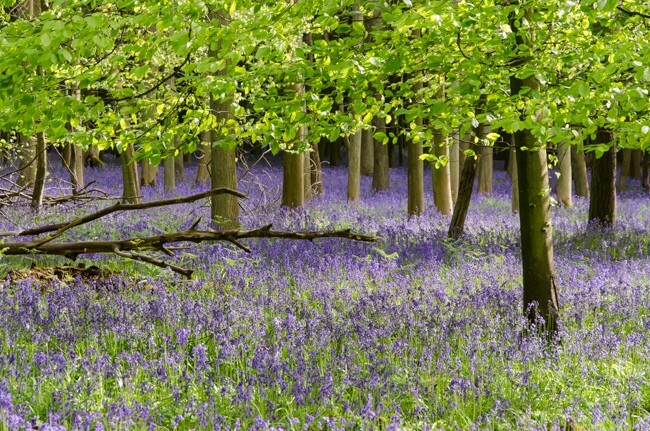 We are incredibly lucky to be living near one of the best bluebell woodlands in the country at Ashridge Estate. My heart was beating with anticipated excitement as we drove through the prettiest little village of Aldbury to get to Ashridge. And then it gave a little skip as we turned a corner on the path and there was the most amazing surreal blue sea spread out below the fresh young green of the tall beech trees. There was a fantastic display this year and yet every year it surprises me at how blue it all is. In another week or two it will be just a memory again. While at Ashridge, we picked some wild garlic leaves as I always had in the back of mind that there must be something of use in them seeing as how they smell so strongly as you brush past on the footpath. And boy, I was not disappointed; raw the crisp leaves are crunchier than spinach with a green taste and pungent aroma of garlic; cooked, the softness is comparable to spinach and the garlic is tempered to a light scent. I ate handfuls straight from the carrier bag; I had leaves folded into a soft egg omelet. I was still left with half a carrier bag and yet wanting to preserve their uniqueness for longer than the leaves would last even in the fridge. 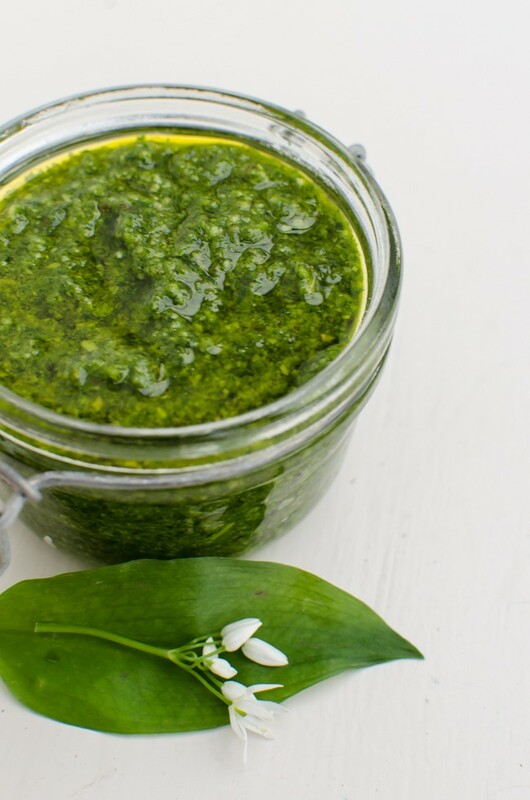 And then I remembered a dish that John Wright from River Cottage cooked us when we went on the River Cottage hedgerow course a few years ago; wild garlic pesto. Of course, John made his with pig nuts which we spent many happy hours digging out of their water meadow but in real life only a sadist would want to waste time digging up a tiny pea sized bulb of a plant to make a dish. (Sadly, I have been known to go to such lengths) So I made mine with walnuts brought back from Iran, and I have to say I do not think the recipe suffered for the change. Indeed, if the feeling takes you then please make fresh gnocchi for the second recipe but also do not feel guilty using good quality ready made gnocchi; I don’t. 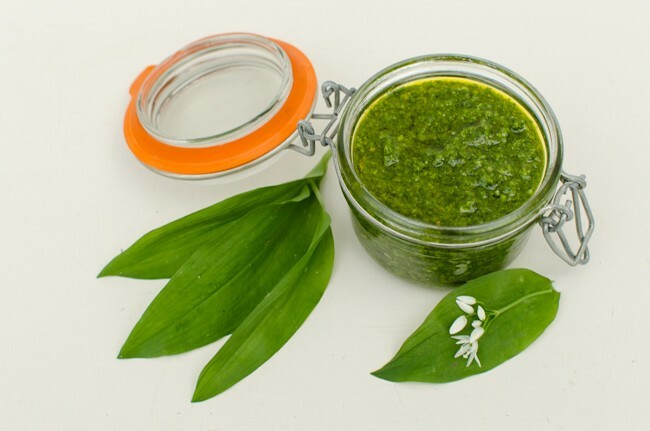 In a small food processor, blitz the garlic leaves and garlic clove with a good glug of the oil.When chopped down, add the nuts and blitz again until the nuts are fine. Add the cheese, lemon zest and a good pinch of sea salt and blitz again to mix. Add the remaining oil in small lots until the desired consistency is reached. Store in a sterilised jar with more oil over the top. Keep in the fridge and use within 2 weeks. Cook the gnocchi according to the packet – using just dump them in boiling water and they are ready when they float. Steam the asparagus. Drain, reserving a little of the boiling water. 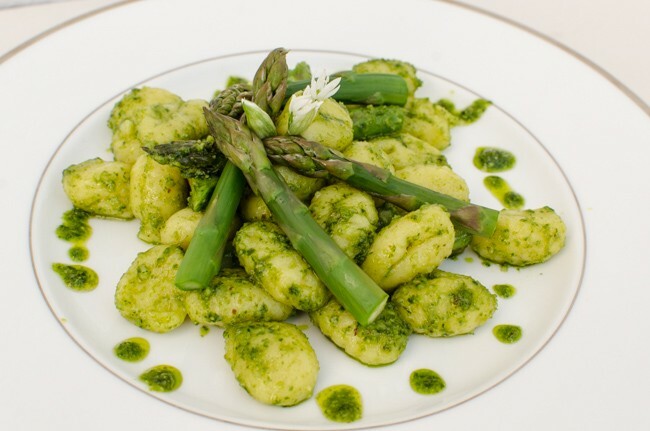 Put the gnocchi back in the pan with the asparagus which you have chopped into short batons and stir through the pesto. Serve up and liberally sprinkle over large shavings of parmesan.